Yes Session 2.0.2 is now available the app store. Yes Session will let you tell your idea to a sympathetic listener. When it starts, Yes Session is already listening - and recording your idea. Yes Session will encourage you to continue brainstorming! If Yes Session hears that you have been speaking above a certain level (set by the arrow) for a certain amount of time, the arrow will turn red, and you can be sure that it's heard you speaking long enough. When it notices that you have stopped speaking, that's its cue to encourage you again! If you want to pause to collect your thoughts, tap on the boss's portrait, which will turn pale. Tap it again to continue to develop your ideas. If you want to start over, tap "Start over". You will be asked to confirm whether you want to erase your recording. If you want to hear what was recorded so far, tap "Hear" it will turn into a "Stop" button when you've heard enough!. You can email your idea out to yourself (or to anyone, really) by touching the "mail" button. You can edit the text in the message, and can also cancel it without sending. If you are using headphones or earbuds, you won't be able to record the prompts, and you'll only hear your responses! 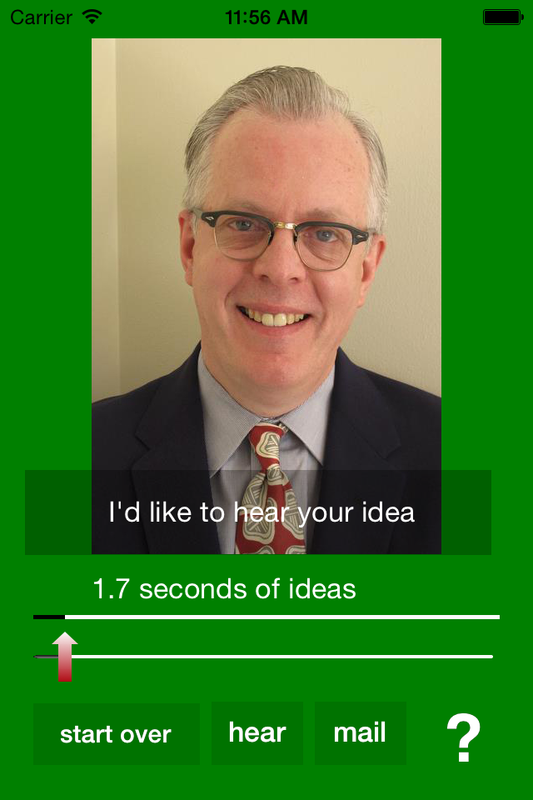 Your recorded idea is in AAC format, called "yes-session-temp.aac". Yes Session has some controls to make it more responsive. and also the amount of time ("talk time") you should be continuously talking in order for Yes Session to recognize that it's not just hearing background noise (the default is 0.75 seconds). You can use the iTunes Document interface to add your own audio. Make sure it's in a .wav, .aac, .mp3, or .aif (or .aiff) format, and less than 30 seconds long. I like to make it 11025 Khz mono to take up less space. If you start your audio's name with a +, it will be added to the introductory phrases. The name of the file is displayed when it speaks, so name it appropriately! If there are several variants of the same phrase, just throw spaces after the name (before the extension) until it's unique! Unzip it. There should be a directory of audio files. Connect your device to that same computer. Scroll all the way to the bottom of the apps to click on Yes Session in the iTunes File Sharing interface. Scroll up to where it says Yes Session Documents. Drag all the audio files in there. Go to the instructions page. Turn off the standard messages and turn on the custom ones. The file "yes-session-temp.aac" that you may see in the Documents directory contains your last recording! Stories.zip, prompts for story telling . You can use the slider controls below to enable and disable the use of the custom and standard messages. These sliders are off when on the left, on when on the right. In order to use custom messages exclusively, though, you must include at least one "introductory phrase" with a filename that starts with '+', otherwise it'll have nothing to start you off with! And if you like this app, give it a nice review! Thanks to Skyvue for the great photo! Yes Session is a lot like part of a program I wrote a very long time ago that ran on Commodore Amiga computers. Yes Session is by the author of the highly praised synthicity itself, SrutiBox, Droneo, Tondo, Wind Chimes, Enumero, Minute, Banshee, and LakePiano .